In college, I spent a summer in Florence. I remember being homesick and not loving my living situation, but nonetheless, absolutely falling in love with the city. The smells. The amazingly old architecture. The gardens. The bustling market. The street art. The flirting men. The romantic air about the city. And, of course, the food. Being a poor college student, I didn’t have the money to eat at too many of the incredible restaurants Florence tortured me with. But the wonderful thing about Italy is that you don’t have to go to those crazy expensive restaurants to get food like you have never had before. Every teeny tiny Mom & Pops shop has housemade pasta and family recipes for sauces that have been handed down for generations. There was a little place I liked to go just on the outskirts of the Duomo tourist madness. It was kind of tucked away in an alley, and I always sat outside, under a white umbrella, in the shade. And I always got their Carbonara. 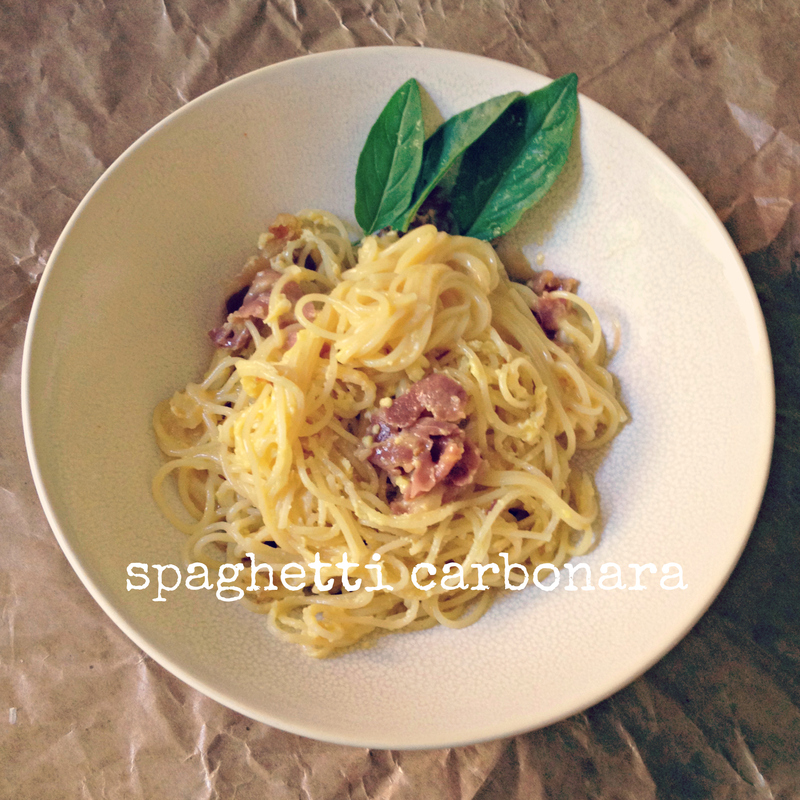 There was something about that Carbonara that cured a touch of my homesickness – it reminded me of a pasta dish with peas and scrambled eggs that my mom would make for us as kids. But sitting on a quiet side street of Florence made the simple dish so much more sophisticated and lovely. The other day we didn’t have much in our refrigerator, and I didn’t have a lot of time for lunch. But we had Prosciutto. And we had leftover Spaghetti and Reggiano Cheese. And we had eggs from the Market. I know pasta isn’t exactly a normal summer lunch, but every time I eat a creamy, salty Carbonara I am transported back to Florence. 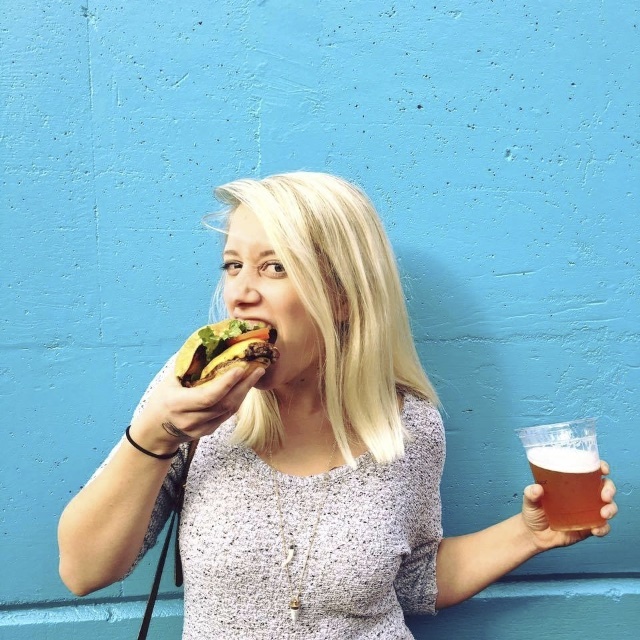 I am taken back to that summer when I trekked all over Italy and took wine classes and a cooking class and realized how special the world of food can really be. And even now that I’m grown up and love my life and my living situation, a girl still gets homesick from time to time. And making a fancy version of Mom’s Pasta and Pea Scramble still helps a little. Cook the Spaghetti as directed on package. While the Spaghetti is cooking, heat a saucepan over Medium heat and add olive oil. 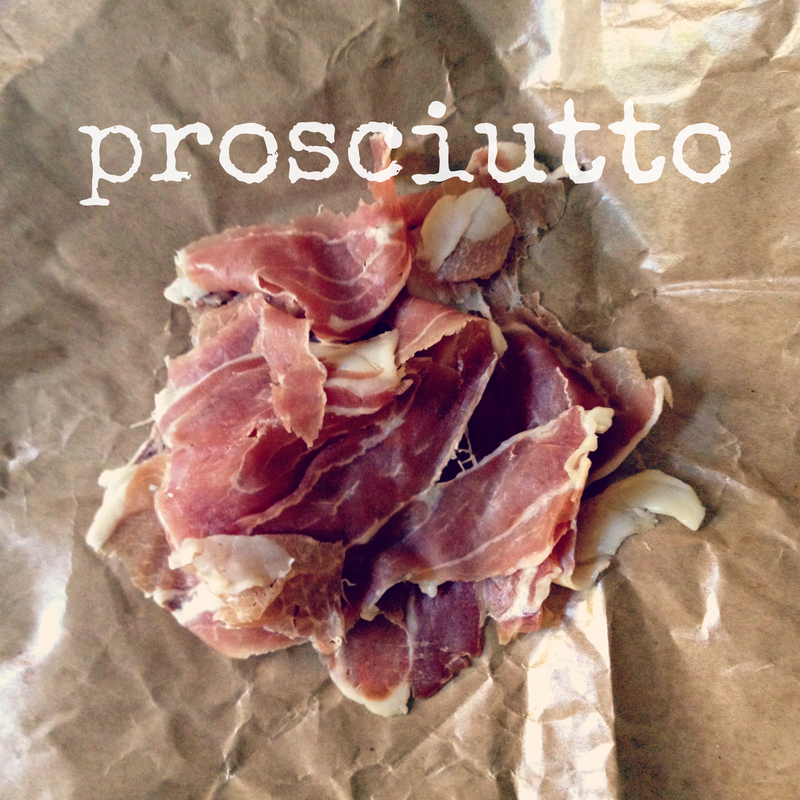 Sauté Prosciutto in your hot pan to get it a little bit crispy. Add the minced garlic for just a minute to soften and lightly brown. Remove pan from heat. When the pasta is finished cooking, strain it well and add it while it is still hot to your pan. 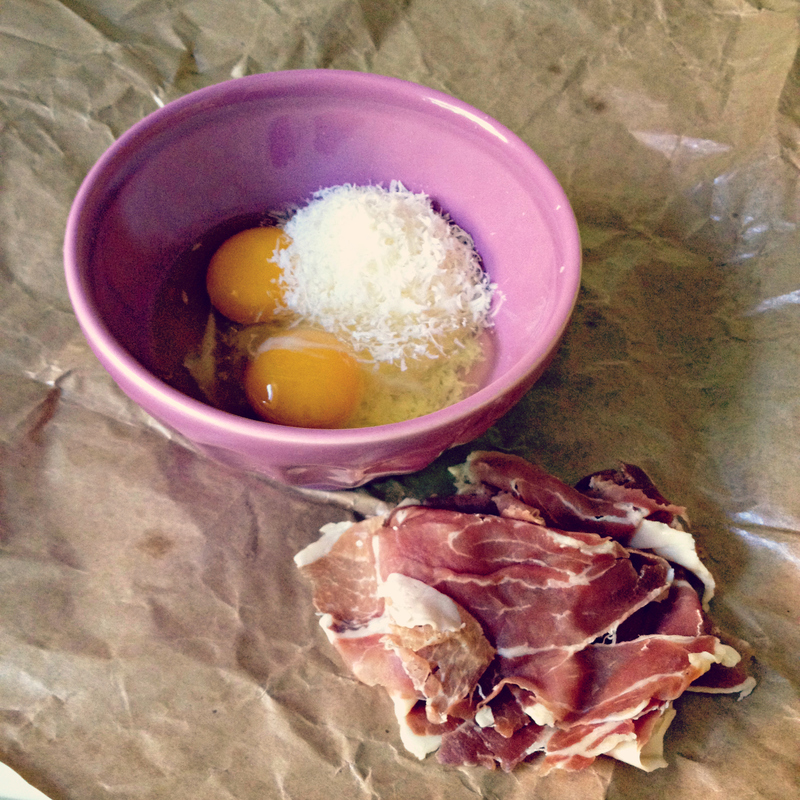 Toss to mix with the olive oil, prosciutto and garlic. 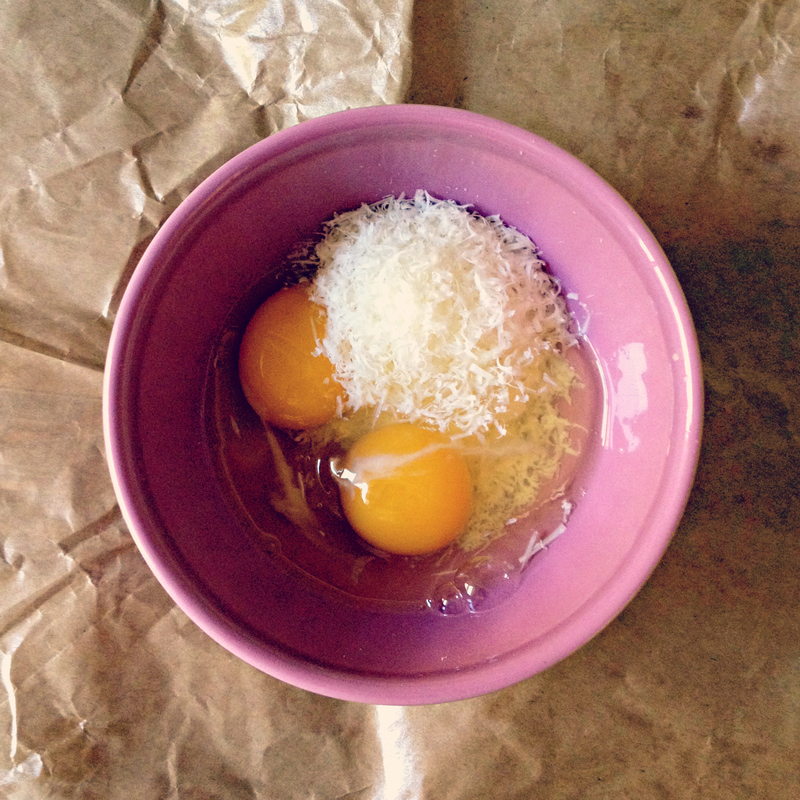 In a separate bowl, beat together the eggs and Parmesan cheese. Pour the egg mixture over the hot pasta and mix it quickly. You do not want the eggs to scramble, but instead just barely cook with the heat of the pasta (this is why we removed the pan from the heat). If you would like a thinner sauce, reserve a bit of the pasta water to add at this time or add a touch of cream to your egg and cheese mixture. Season with salt and pepper and top with fresh herbs such as basil or parsley and another sprinkling of freshly grated Parmesan.